New York City has long served as a beacon for those in search of a dream, a new beginning, or a new way of life. People from all over the world have flocked to this great city, many times against all odds, to find their dreams fulfilled. Given its notorious pioneering spirit and ethnic diversity, New York City’s cultural impact on the world at large is unprecedented. Over the years, its awe-inspiring cityscapes have been the muse of countless artists, photographers, poets, writers and dreamers. In his latest work, contemporary painter Michael Flohr pays tribute to his own artistic infatuation with this dynamic corner of the world and its magical ability to make dreams come true. Fittingly, the artist chooses a composition honoring one of midtown Manhattan’s most famous architectural landmarks, Radio City Music Hall. The historical significance of this landmark is one of enterprising, artistic vision in and of itself. After the stock market crash of 1929, John D. Rockefeller collaborated to create “a place of beauty offering high quality entertainment at prices ordinary people could afford. It was intended to entertain and amuse, but also to elevate and inspire. It was designed as a symbol of optimism and hope.” Today, Radio City Music Hall and Rockefeller Center thrive as a vital part of New York City’s architectural and cultural landscape. 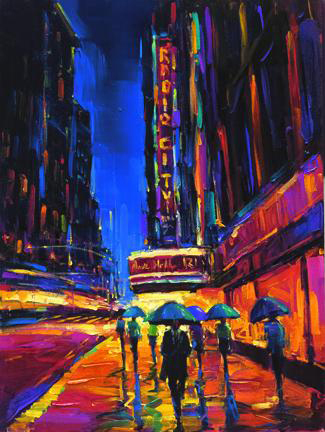 In “Big City of Dreams”, Flohr expertly fills his canvas with light and color, in spite of the evening rainfall that sets the tone. Flohr’s staccato brushstrokes and seemingly frantic, impressionistic style embody the collective energy of this remarkable city. Against the backdrop of the city night, the luminous reflections born from the rain and the majesty of the Radio City marquee illuminate this street scene. Flohr’s juxtaposition of color, texture and light give his work an enchanting, dreamlike quality. So, wake up with Michael Flohr in The City That Never Sleeps and you may find that your “Big City of Dreams” is just within your reach.